My great grandfather was Charles Mazeres . Charles was from Ogeu les bains, France. He made his way to San Francisco in the early 1890s. He and my grandmother, Brigitte Breilh, owned French Laundries. The earliest laundry I’ve documented is the one he owned in Modesto, California, 1903. By 1910, they owned at least two in Oakland, California. My great grandfather died on Christmas Day in 1925. My great grandmother took over management of the laundries and ran them herself with help from her daughter and family. They weren’t the only ones on my Dad’s side who owned French Laundries. Several of his relatives had their own businesses in San Francisco and Oakland (Breilh, Segalas, and Lascurettes families to name a couple). As my Uncle once told me, it was a cheap business for an immigrant to start with. You only needed a way to wash clothes and some irons to open business. If you did well, you could expand and buy better equipment. 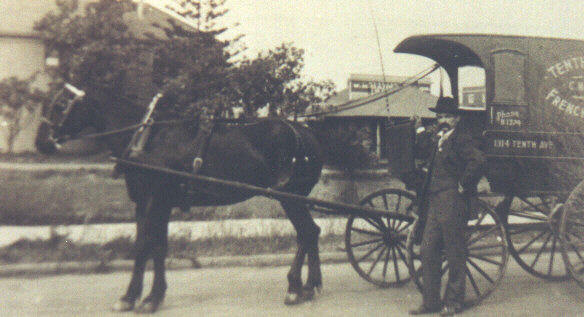 This is my great grandfather with his delivery carriage sometimes around 1910. 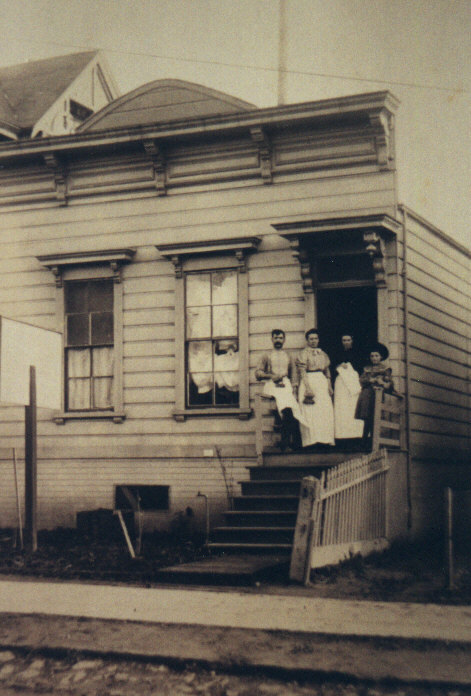 This is my great grandfather, great grandmother, my grandmother, and one of their employees in front of their laundry in Oakland. This was probably taken around 1908-1910. Wonderful pics. God bless the memory of our hardworking ancestors who built this country. Hello, These are certainly cousins to me,that I have recently learned about.My grandfather was Jean Emile Larrouy-Castera awho emigrated to San Francisco in 1923 he followed most of his family who were born in Ogeu-les-Bains. Thank you so much for your comment, Duane! I believe their could be a connection between our families. I have sent you an email.